Keeping cool during the long summer months in the South isn’t always easy –– and when it is, it can land high energy bills in your mailbox. Don’t sweat choosing between your comfort and utility bill budget by installing retractable awnings or canopies. Gerald Jones Company can install Durham, NC awnings for windows or doors, or a retractable option for your patio or deck. Window and door awnings help literally shade your home from the sun’s penetrating rays, which means your air conditioning system won’t have to work as hard to cool your house. They also help keep guests dry from rain while waiting on your front step. These are highly customizable to fit your tastes and needs, and are even available in fabric or metal. Retractable awnings (or canopies) are ideal for when you want to sit outside, but want to avoid the rain or damaging UV rays. Because the awnings are retractable, they are only out when you want them to be, therefore enhancing their durability. 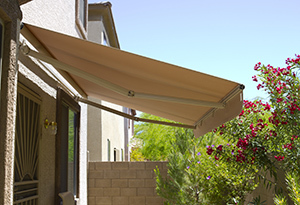 You have several options when you opt for a Durham home contractor to install your patio awning; you can roll and store them away, or you can order them with a motor so you only have to lift one finger to roll it up –– and that’s to press a button. Our Durham retractable awnings and window/door shades also help protect the furniture outside as well as inside your home, shading it from the sun’s penetrating rays. Your carpets will enjoy an extended life as well, as they are less likely to fade with sun spots. Whether you want a cool spot on your patio to watch your children play in the yard, or you want to shade your windows and doors, Gerald Jones Company has the awning and canopy solutions you’re looking for. Call our Durham home contractors today at 919.286.1700 to request your free consultation. This entry was written by geraldjones, posted on May 6, 2015 at 4:19 pm, filed under Uncategorized. Bookmark the permalink. Follow any comments here with the RSS feed for this post. Both comments and trackbacks are currently closed.